Today we received the December 2010 nonfarm payrolls, the nonfarm payroll increase for December 2010 was a disappointing 103,000. Consensus was for 150,000-175,000 increase. However, there was a large drop in the unemployment rate from 9.8% to 9.4%. The Household Survey gives us the unemployment rate. The Establishment Survey gives us the change in employment, 103,000. There are always anomalies during the holidays, particularly in the Household Survey. The rate of unemployment fell as the size of the workforce fell. Some of the decline in the unemployment rate seems to have come from discouraged workers. The number of Americans classed as not in the labor force- and therefore not counted in the survey- increased by 1.5million between December 2009 and December 2010. The U-6, broad measure of unemployment, slipped slightly to 16.7% from 17%. Local government total employment fell by 268,000 jobs between December 2009 and December 2010. State governments reduced total employment by 140,000 positions over the last year. 20,000 net jobs were lost at the local government level over the last month of 2010. The December Jobs report fits into the big picture dynamic of today’s US economy. We have a tug of war scenario between good and bad news. This is creating a situation where inflection and focus profoundly color how people see the conflicted news flow. We are witnessing a tug of war between economic strength and economic weakness. Weakness out of Europe- over the last year and again today- is partially offset by strength in much of the developing world. Lower income Americans, indeed the bottom 60% of income earners in the US, remain deeply mired in recession. Upper income Americans are over a year down the road to recovery. We see high end retailers surprising to the upside with their 2010 holiday sales. We see retailers to lower income folks struggling to meet expectations. Stimulus has come in large, unevenly distributed doses. Most recently the Federal Reserve embarked on a $600B Quantitative Easing (QEII) program that many of us argued was a fiscal policy of sorts. QEII seeks to keep interest rates low and keep the quantity of debt available to Uncle Sam up and the cost of the debt down. There is a tug of war here too. Rates have been drifting up, but remain low. In December 2010 Congress joined in with another $700+Billion tax and spending stimulus program. This program extends unemployment insurance, Bush Tax cuts on income tax, capital gains and estates. Despite the stimulus from the Federal Government, state and local governments are in real duress. Their pension plans are under budgeted by around a trillion dollars. Multibillion dollar budget problems define the circumstances in most states. Local governments are in even more dire shape and rely on states for over 30% of their budgets. Thus, states and localities are giving us an austerity program as the Federal Government gives us stimulus. More tug of war. Equity markets have recovered the levels they had achieved just before the Lehman Brothers collapse. Labor markets most certainly have not. The fourth quarter of 2010 is likely to be one for the corporate profit record books. It is a tug of war. 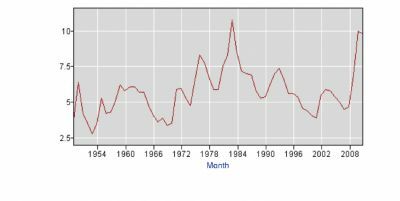 The graph below displays the Unemployment Rate from 1947 to 2010. It serves to put today’s numbers in perspective.